Home › blog › So What are You Doing Now? It’s time I explain what the new job is that was intriguing enough that I left the idea of The Big Ride behind. 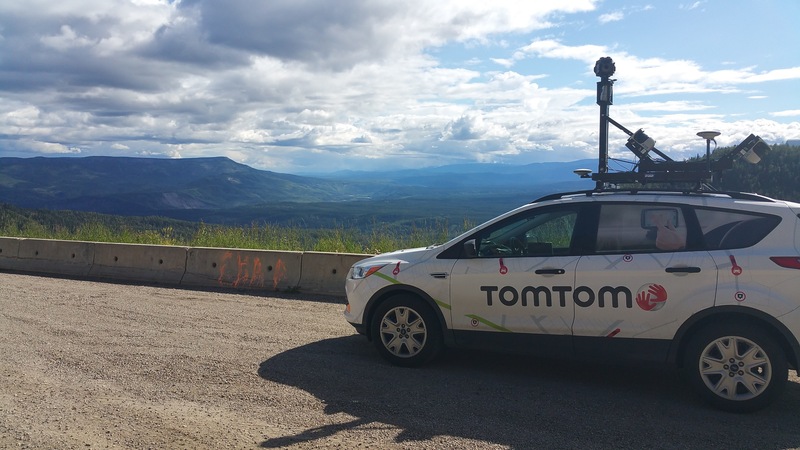 I’m now a mobile mapper for TomTom. What’s a ‘mobile mapper’ you ask? Well, the way I usually describe it, for the sake of brevity is “Think Google Street View”. It’s actually a pretty accurate description of what I do, even if I don’t work for Google. Side note: even the Google Street View mobile mappers don’t work for Google – they hire contractors to do the work. I assume that there are large numbers of folks who do work for Google that are working on Google Street View – just not the mobile mappers. A slightly longer version: I drive a car around collecting updated map data for the purposes of quality control for TomTom’s maps. The car has a wide array of data collection sensors. Two dimensional (wide angle and high def) photos, distance to obstructions (overpasses, buildings, and road surface for example), and GPS data all get collected while I’m working. The fine folks at the TomTom Mothership can then take that data, compare it to our existing maps data and make any corrections that might need to be done based on the new information. There are some significant differences between what I do and Google Street View, but the primary one is very simple: The information I collect is never made directly public. What’s that mean? Well, if I drive down the street past you, and you’re in the act of picking that wedgie, you don’t have to worry – no one outside of TomTom will see that photo. We’re just using it for quality control. If your street name changes? We have a photo to show us the spelling. That photo of the on ramp is a great way to cross reference the GPS data and double check our work. That kind of thing. Your friends won’t be able to post a blown up copy of your wedgie indiscretion. ‹ What Happened to The Big Ride?